Didn’t know she had one. Me ether. O.o HAS she ever been drawn with a nose? I don’t recall a single instance. Middle frame of yesterday’s strip! Also here: http://wapsisquare.com/comic/with-great-power/ and a bunch of other strips around then. She has a petite nose when she is maintaining a human form (I’m not clear whether it’s a shape-shift or a glamour). She tends to lose it when startled or embarrassed… can’t maintain enough concentration to hold the form, I guess. And the rules are that you have to maintain human form in high school. I wonder what would happen if Daylla couldn’t maintain human form? It’s likely akin to a school dress-code violation. First offense is a warning, second offense is a warning with some form of light punishment, third or flagrant offense is a meeting with administration and possibly parents over the ramifications. With the possible nod towards students who truly have difficulty holding human form. Like any dress-code, the intent is likely societal training. Can you hold human form when it really counts, and not blow your para-cover. Such as when out on a date, and your friend embarrass-bushes. Daylla has previously goaded the “boyfriend” issue on Castella to the point where Cassy broke her human-guise & sprouted flowers. 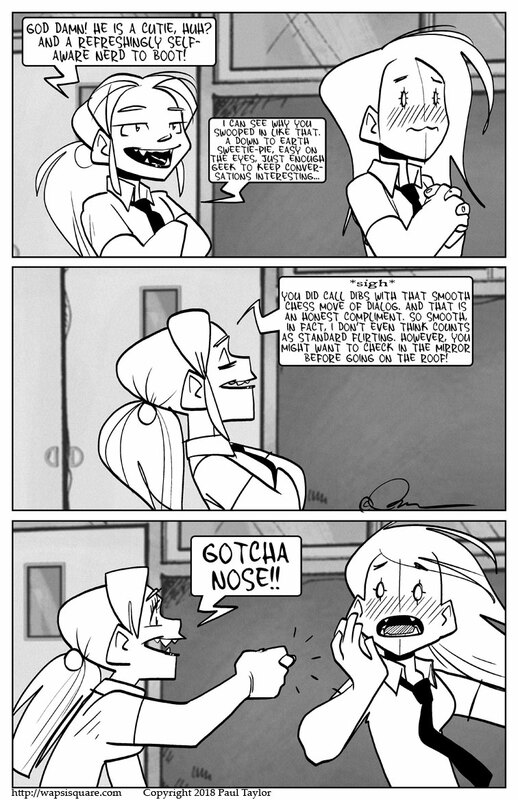 Now Cassy has turned those tables to the point where Daylla has lost her nose. Pretty straightforward, actually. Still funny as hell, too! So even Cass thinks he’s a catch, but wants Daylla to score the win. That’s a good friend for you. Two friends, each needing the other’s support when it comes to sorting out personal feelings and relationships. Synergy at its finest. They’re BFFs for life. Actually, they’ll be NFF; Nerd Friends Forever! I’ve no wish too be crude but both Castela and Dalylla are sinophiles. As such, I’m sure they are both well aware, there are several cultures that particular gesture can be seen as a Double Entendre. This one actually made me giggle out loud! I wouldn’t want anyone kicking her. Might break some toes. No, but I’m picturing her wandering around, unaware of the dozens of magnets her friends have stuck to her back.